BOOKTRYST: Unscrambling Samuel Beckett's "Whoroscope"
His first published poem is a real flooz, er, doozy. What do you call a 100-line poem narrated by a grumpy and delirious René Descartes while he anxiously awaits being served an egg that better have been hatched between eight and ten days or else, and that is - Mother of Mercy! - annotated by its author? 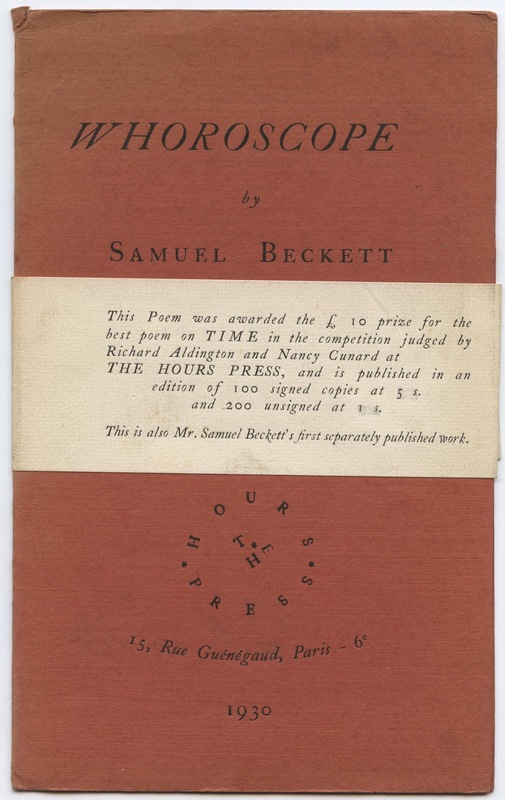 You call it Whoroscope, Samuel Beckett’s first published poem. 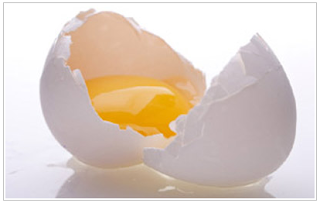 The method of this study mirrors an ooscopy, a divination from eggs. And it is not alone the fowl taste of the renowned philosopher Descartes for omelets 'made from eggs hatched from eight to ten days' that inspires this approach. Patently, this biographical fact fertilized the imagination of Samuel Beckett, its implicit absurdity underlying his perverse embryogenetic treatment of certain major philosophical, religious, scientific, and emotional crises in the life of Descartes. As a realized conception, the egg in one way or another yokes together these predicaments. The poem is legendary for its creation. Beckett cranked it out in one night, in Paris, desperate to meet a submission deadline. He completed "half before dinner, had a guzzle of salad and Chambertin...and finished it about three in the morning." He then mailed it for consideration in a poetry contest held by shipping-heiress and poet, Nancy Cunard. He won (£10) and Whoroscope was published in its first separate edition by The Hours Press, Cunard’s small publishing house devoted to literary Modernism and experimental poetry, in 1930. You can read the full text of, and annotations to, Whoroscope here. Well, maybe not the Cosmic Egg. Sometimes an egg is just an egg. A beautiful copy (No. 59) of this, the first separate edition of Whoroscope, one of only 100 signed copies, and including the usually absent wraparound, has come to market, courtesy of Santa Barbara-based rare bookman, Ralph Sipper (aka Joseph the Provider). A fragile little thing (the book, not Sipper), the wraparound even more so, it is somewhat miraculous that any have survived in complete state. It is dear and highly desired. 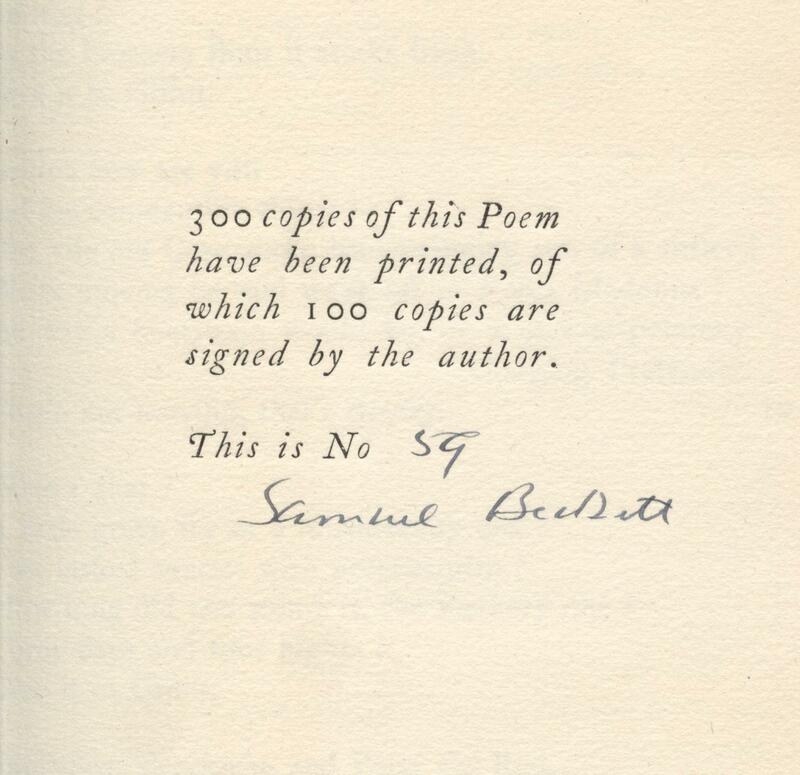 BECKETT, Samuel. Whoroscope. Paris: The Hours Press, 1930. 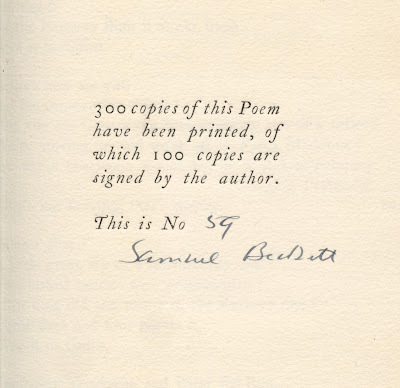 First separate edition, one of 100 copies signed by the author (of a total edition of 300). 8vo. [ii], 4.  pp. Printed wrappers. Images courtesy of Ralph Sipper, with our thanks.